I remember that you ran obituaries on Lars and Ruby (Adams) Sivertson when they passed away. The “Find a Grave” web site for Lars listed his own family. However, the “Find a Grave” website for Ruby provides links to her parents as well as all her known deceased siblings. One of the links is for her sister, Lorena (Adams) Aus, who apparently worked at San Haven at some point in the past. Some of our alumni who lived and/or worked at the San may remember her so I am providing a complete web site from Google for Lorena: “Lorena Adams Aus (1921 – 2007) – Find a Grave Memorial”. The web site for Ruby is: “Ruby Adams Sivertson (1926 – 2015) – Find a Grave Memorial”. Your family and our family’s mailman, Bob Stickland’s wife, Irene, was an Adams too, sister to Ruby Sivertson. Two of my 2nd cousins, Brothers, Larry and Alney Kofoid married two Adam sisters too. Their mother too was a sister to Ruby and Irene. Looking in the Bottineau Centennial book there were 11 siblings in Ruby and Irene’s family. Lars and Ruby Adams Sivertson’s daughter, Theresa Sivertson Delikat is on our distribution too. I’m sure Theresa and Leland Stickland can fill us in with all the history of the Adams family. No need to apologize Gary, don’t ever have to, we all understand what you are enduring and will be enduring. It takes a good caring person to be able to withstand everything you are going through. God knows you are that. All the people who work with Bernadette also need to be commended, it’s a long hard journey. I will say prayers for you to help with this heartbreaking journey. God Bless all her family for being there for you and Bernadette. God Bless everyone with their big hearts helping you two. Thanks Ginger for the consoling words. You are right, it’s a challenge. The hardest thing for me to deal with, with Bernadette now is with my every move, she asks me where I’m going and what I’m doing. I mean every move too just going from one room to the next. When I tell her, often times she doesn’t understand. When I leave to go somewhere, she gets very angry. It’s hard to understand her now too, so when I don’t understand what she wants she gets very upset too. Most of the time when our help leaves at 9 PM, Bernadette is in bed with the door open. She will continually call me asking when I’m going to bed. When I’m in the office, 30’ from her recliner, like right now, she is continually calling me. If I don’t answer she gets mad. If I don’t go in the house she gets mad. Her short term memory is very much affected now too. She can’t walk without assistance. Yes, it’s becoming a challenge, but we will make. When I’m not here she is much better behaved making it much easier for the girls to take care of her. Thank god we’ve got good wonderful understanding help. Reply from Cheryl Haagenson (71): Dunseith, ND. This is so late and so last decade, however Earl Schneiderman and his dad did live behind the Elvin Haagenson farm for a while. They lived in the house that belonged to my Aunt Alpha and Uncle Ed Gunderson. They, Ed and Alpha moved to Arizona due to my uncle’s health issues. Dad said that the reason the Schneiderman’s took shelter was because of a fire. They would stop sometimes for coffee on their way by. I recall Earl had big cars, but in those days most of the cars were big, perhaps loud would be more accurate. Dad thinks they stayed about a year. I remember when we left we inherited an Irish Setter! Brenda and Dale opened the can of worms when they brought up cars. I’ll try to keep my ‘dissertation’ short. Brenda mentioned the number of cars you could legally sell in one year without a dealer’s license. In 1968 it was 5 cars. Dad got a letter from the state telling him he had sold all he could without getting one. He had just sold off extra vehicles and bought others, but it was too many according to them. I do remember Barbara Schlaat’s, salmon and white, finned Plymouth. I believe Emil and Ann Metcalfe bought it later and it eventually ended up at Jim Birkland’s farm out in the trees. I think it’s still there. In the summer of ’66, I was pumping gas at the Standard Station on the north end of Main Street. A Canadian drove in with a big Oldsmobile that was made in Canada. I opened the hood to check the oil and there sat a dinky 250 cubic inch Chevy six cylinder engine. I saw the guy go into the restroom so I thought he was out of earshot when I yelled at John Bogus to come out and see what this guy put in his big car for an engine. We were chuckling about it and hadn’t noticed that he had come back out and was standing there listening. He gave me a snap lecture about how, “I’ll have you know that is a factory engine and is all that is needed to make this automobile function as well as anything you Yanks have down here!” I’ll say–crap. The starter had as much torque as that engine, but he was as proud of his car as he was of his ‘flat hat’. We laughed out loud when he ‘powered away’ from the pumps. The Canadian built cars had different chrome and also went by different names than the American built cars of the same manufacture. Ford trucks were called Mercurys, Mercury cars were called Meteors, and some Pontiacs were actually Chevys with odd chrome. Lamoureux Bros. Ford garage used to get model cars for each year of production. They had these models displayed on a shelf in the showroom and I used to go in and drool while looking at them. I asked several times if I could have one, but they were all spoken for. The Lamoureux Bros. used to give these model cars to kids when the new models (next years) came in. I can remember as plain as if it were yesterday, Dad and Jay Lamoureux and I went out shooting gophers at Ernest LaCroix’s farm west of Dunseith on Good Friday, 1961–I was 10 going on 11. When we went back into town, Jay said he had something for me if we stopped at the shop. He handed me a baby blue 1961 Ford two door hardtop model car! I thought I had the world by the tail! I kept it for many years but gave it to someone when I was older. It nearly impossible for me to stop talking about old cars so I’ll just have to quit, as I promised! Thanks Gary! 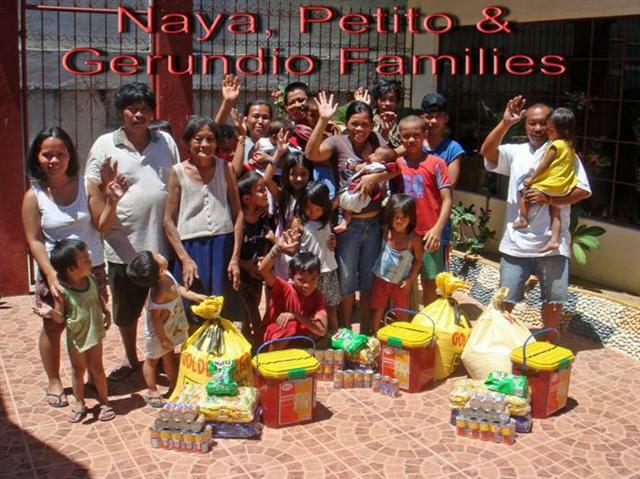 A very generous Dunseith Alumni couple provided funding for food for these three Filipino families pictured below. With the money they sent, we purchased three 25 KG bags of rice along with the other food items shown in the picture. These folks were so happy. After purchasing these items, we asked these three families to come to our house to pick up their grocieries. They repeatedly thanked Bernadette and me as they left. When the neighborhood heard we were doing this, folks started coming to our house thinking there was more. These three families all came back with thank you letters the next day that we forwarded onto the donors. On a typical day, when these folks get up in the morning there is no food in their house. Family members will go out seeking ways to earn a little bit of money to provide a little food for their family for the day. They will try and find odd jobs here and there. Often times they will go around the neighborhood selling food items and other stuff on consignment. They are willing to do anything at all just to make a few Peso’s to feed their families. Many days they have very little and some days nothing at all to eat. In spite of all this, most are happy go lucky friendly folks with a smile. With the donations we received yesterday, the Dunseith Alumni has helped 6 needy families. The Dunseith Alumni has currently contributed $238 for these folks. With the many needy families in our area, to simplify things, Bernadette and I have decided to merry up separate families for each donor. Subsequent donations that individual may send will go to the same family/families. Brenda Hoffman (68) is the one that has spearhead this whole effort. We have an FPO address (Regular US mail). Packages greater than one pound can not be sent to this address. I have been rather busy lately, so I have not had a chance to post these latest pictures on the site. This is interesting, but not 100% a surprise. A few years ago, I heard something about a Brudwick who might be related–I don’t know where I read/heard this. It caught my attention at the time, but nothing ever came of it. I don’t know of a Carl Brudwick who is a relative of the Bottineau Brudwick’s; Eileen Brudwick most likely has more information on distant Brudwick relatives than I do. Many people used, as a sir name, the town where they lived. This was the case with my great grandfather, Steffen Bruvik (On some letters, he’s signed it “Steffen Bruvik”; on others, he’s signed it “Steffen Bruvig”. My great grandfather and his wife, Ingrid Aasheim, lived in Bruvik, Norway (Bruvik is on the island of Osteroy.). Steffen/Ingrid had four children who lived to be adults: Anna, Arne, Anders/Andrew, Axel (American spelling). Anna and her husband lived in Washington state; they had two daughters, Helen and Anita. Helen married and lived in Ferndale, Washington. She/her husband have three children–two boys and a girl. Anita married a Canadian and lived in Canada. She/her husband had two children–Carol and Larry, who both live in Canada. Carol is married and has, I think, 5 girls. Larry never married. Anna died when her daughters were quite young. Her husband remarried a few years later. Eileen, you know the history of Ole’s second marriage/children better than I do. Arne moved to Blooming Prairie (later Bixby) Minnesota and married Mathilda. Arne/Mathilda had five children: Edward, Margaret, Merton, Agnes, Arnold. I don’t remember who Edward married. I think he/his wife had five children; I’ve only met two of his children—Shirley and Izzy. I think one son lives in Mankato, MN. As I understand it, Mathilda changed the spelling from Bruvik to Brudwick. Andrew/Anders married my grandmother. They had six children: Emma, Milen, Alvina, Alice, Kenneth, Gerald. We are the “local” Brudwick’s. Axel was killed when a ship he was working on, hit a mine that was left over from World War. He wasn’t married. I know/have visited some of Steffen’s cousins/nieces, but I have never heard of a Carl. Again, Eileen would know more about this. If she doesn’t know, she’ll find out!! Right, Eileen?